So you’ve signed up for the best rental kart championship in the country. You’ve bought a cool new race suit, booked yourself some practice – and you can almost taste Formula Fast’s famous pizza. But there’s a problem: You’re 60kg and people have been talking about a standard minimum weight for drivers of 90kg. The solution? Create a weighted seat. Now first we should point out that the Formula Fast are able to supply you with up to 20kg of lead blocks to fit in the sidepods, so in our example above, the driver would only require an additional 10kg of weight. 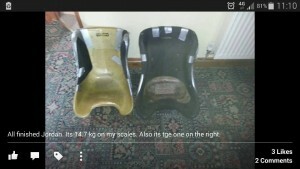 However, it’s up to you how much of your additional weight comes in the form of a weighted seat. We’ve seen drivers with 5kg-30kg over the years. As long as the seat is deemed safe and presentable by the officials, you will be able to use it at BRKC. The first port of call when starting this little project is getting hold of the seat itself. 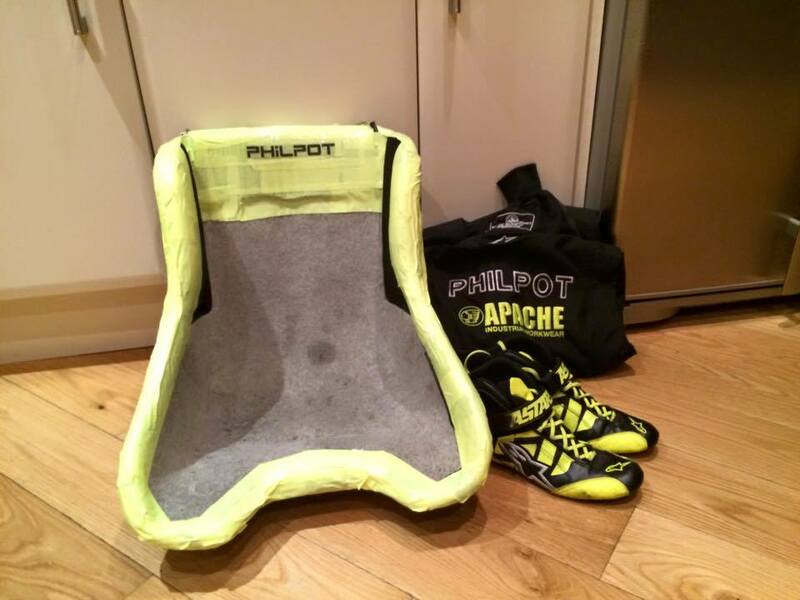 We recommend a Tillet kart seat, preferably Medium/Large or smaller depending on your size. 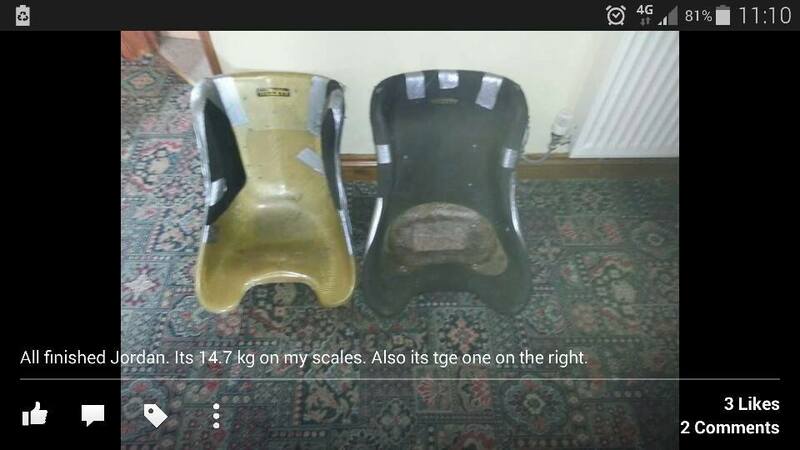 If you’re lucky enough to know some ‘owner driver’ karters, pester them for one of their old damaged seats. Since you aren’t bolting it to the rental karts, it doesn’t need to be in the same condition as on an ‘owner kart’. However, most drivers will find a seat on Ebay. 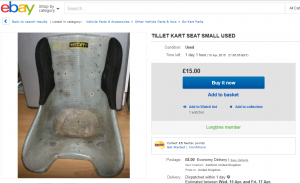 Don’t pay more than around £30 for one – and never buy a brand new seat unless money really is no object. Now you’ve gotten hold of a seat, you’ll need to attach the weight. This should be in the form of lead sheet which can be purchased at any builders’ merchant. For 10kg, you should expect to pay around £30. It may be worth speaking to local roofing companies (get the yellow pages out!) to see if they have any old offcuts of lead you can have for free. 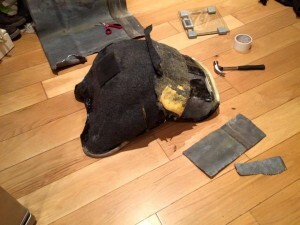 Attach the lead to the back and the sides of the seat with strong adhesive (No More Nails etc.) and allow to dry. Different drivers have different opinions about the best place to attach the weight – high, low, left, right etc. Why not start a discussion on the Facebook group to see what suits you best? The final thing you will need to do is cover the back of the seat (i.e. the lead) with carpet or soft fabric. This is to avoid scratching the rental kart seat. Carpet shops usually have plenty of off-cuts which they can give you for free. Ask other drivers how they made theirs. Make sure the seat fits snugly into a rental kart seat by visiting your local track and trying it out! Adding some car washing sponges under the carpet on either side usually helps in this endeavour if your seat is pretty small. WELL DONE! You’re a professional rental karter. Post some pictures of your creation on the BRKC Facebook group. Now where was that pizza…? And then there were ten. Bradley Philpot, Russell Endean, Michael Weddell, Annelien Boutens, Ruben Boutens, Ted Monfils, Anwar Beroual Smith, Lewis Manley, Ed White and Crispin Zuercher. They will qualify in Superpole format: each driver does a single flying lap on their own, in the same kart. No pressure… it’s rare that I’d rather be spectating, but this time I’m quite happy to sip tea on the VIP gantry and watch the action unfold. As Michael gets underway I’m fully appreciating the recording wizardry for the first time this weekend. The live feed which is streaming over the Web is shown on a screen beside James, and I’m hugely impressed at the professional quality produced by multiple cameras all around the circuit. A DVD of the event will be produced soon, and I look forward to that. Michael is disappointed with his time, shaking his head as he passes under the timing screen on the back straight. He pits and hands the kart to Annelien, who cements her reputation as a qualifying specialist with a sublime lap – a full half-second faster than Michael. And try as they might, nobody can match it. Crispin gets closest, third (Anwar) to eighth (Russell) is covered by seven hundredths of a second. But BRKC 2014’s only female driver will start the final from pole position. Lauren and Becca – sharing the VIP gantry with James and I – are beside themselves with excitement. To begin with, it looks as if she might run away with it as the others squabble over position behind her – Anwar losing several places early on, Ed making a couple, Brad unable to make much of an impression in what looks like a difficult kart, Weddell and Monfils bringing up the rear… but as drivers start to pit, Ruben Boutens begins to wind it up. With half of the 30 minutes gone, he’s taking a couple of tenths per lap out of his sister’s lead. She responds, but he’s relentless; we’re holding our breath as he breaks the 33 second barrier and just keeps going faster and faster. It seems inevitable that he’ll find a way past and when he does – with a millimetre-perfect move into the hairpin – it caps off a supreme display of precision from both of them. Ruben takes the flag, Annelien makes it a Boutens one-two, and Lewis Manley holds off Ed White for the final podium position. Crispin is an excellent fifth followed by Anwar, Brad, Russell, Ted and Michael. We’re sad to see it end, but I’m not sure anyone in the building could have taken much more. We gather on the viewing gantry as James orchestrates the presentation down on the circuit, cheer Ruben, Annelien and Lewis onto the podium – Lewis needing some coaching on how to open a bottle of bubbly – before reluctantly saying our goodbyes. I’ve never seen spirits so high at the end of a karting event, and with good reason. We’ve all had a weekend to remember, and then some. And that’s it. Fat Lady sings. I’m sure I speak for everyone when I say that Ollie and all the staff at Formula Fast deserve a medal. And probably a few extra hours of sleep. We really appreciated the huge amount of work that went into organising and running such a complex event so efficiently. The effort that went into keeping the karts as equal as possible – testing late into the night on Friday and Saturday – was hugely impressive and (despite the odd moan) deeply appreciated. No other venue we’ve visited has ever worked so hard for us. I’ve certainly never been to a friendlier kart circuit – from front desk to pitlane, every single member of staff was a pleasure to deal with. James Auld is a legend and I’ll not hear a word to the contrary. His commentary added a veneer of excitement and occasion – and information – that made BRKC 2014 the great spectacle it was. Having seen the odd snippet of the footage Darren Cook and his team have produced, I can’t wait to see the finished article. We’ve immortalised every BRKC event in video and photographs, but this is a whole new league. And once again, Brad seems to have pulled off the impossible (with Becca’s help) – he’s made the BRKC even better. Downside? We have to wait a whole year before we can do it all again! For final results and videos, visit www.brkc.net. In an exciting change to the British Rental Kart Championship format, series organiser Bradley Philpot is excited to announce that as of 2014, the BRKC will be moving to a single weekend, ‘winner takes all’ event at the brand new Formula Fast Indoor Karting facility in Milton Keynes. The new format aims to mirror more closely the Kart World Championship format, of which BRKC is the official qualifying series. In addition, by working closely with Formula Fast – who are renowned for their kart parity, friendly team and attention to detail – the BRKC’s ambition of being the ultimate in fair, affordable and close racing can be achieved with the focus on just one circuit.